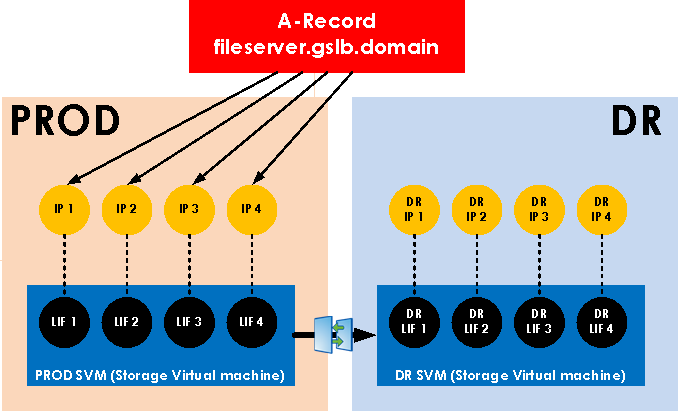 Currently client access to CIFS shares is achieved by accessing the share over a DFS Namespace, and the DNS entry in the DFS path to target folder is simply an A-record of a NetApp 7-Mode Filer/vFiler. As part of a migration to Clustered ONTAP, we’re going to implement external DNS load balancing across a number of data LIFs owned by the SVM (Storage Virtual Machine.) Also, we’ve going to implement a GSLB (Global Site Load Balancing) mechanism to control site failover. Note that the detail is intentionally light here. The following diagram hopefully demonstrates what we’re trying to achieve. The client accesses the share over a DFS Namespace. The DFS Namespace maps to a server share. 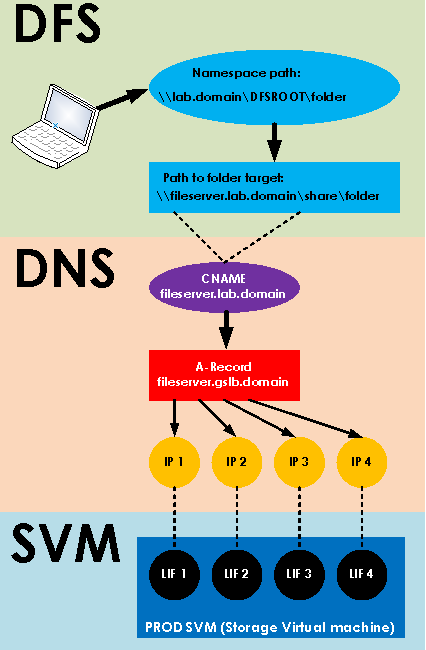 The server name in the DFS path to folder target is a CNAME. This CNAME maps to an A-Record. And the A-Record contains multiple IP addresses (or more accurately - multiple A-Records with the same IP address.) And these IP address in the DNS A-Record relate 1-1 to Data LIFs on the SVM. 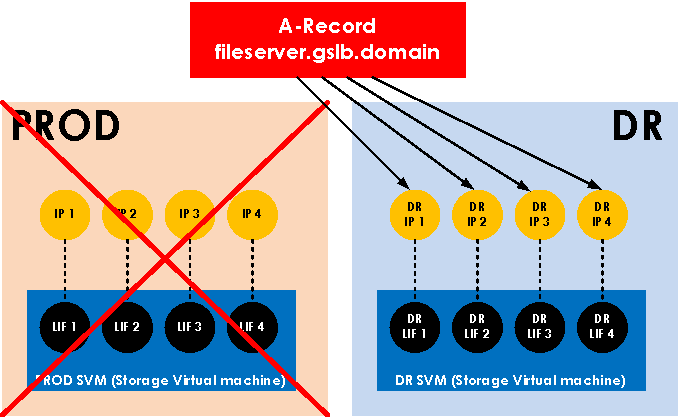 Site failover is achieved simply by updating the A-Records’ IP Addresses in the GSLB mechanism to point to the DR SVM and its LIFs. I have a Windows 2008R2 AD Integrated DNS server (Domain Controller with DNS on), and a standalone, non-domain joined, Windows 2003 DNS server to simulate my GSLB appliance. On the Windows 2003 DNS box, I create four DNS A-records each with a different IP address. Then ping again and you’ll see the IP address changes. Now, back on the Windows 2008R2 AD DNS box, we want to configure it to know what to do with DNS requests for the gslb.domain. 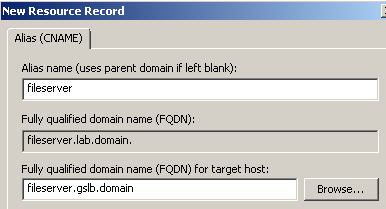 Here we configure a conditional forward to the gslb.domain and point it to the Windows 2003 DNS box. 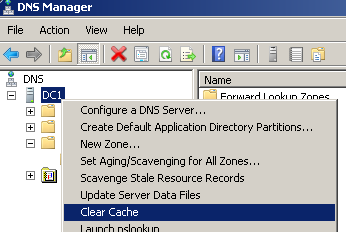 Testing from the Windows 2008R2 AD DNS box, and we can now ping fileserver.gslb.domain. And if we do the ‘ipconfig /flushdns’ and ping fileserver.gslb.domain again, we are pinging another IP address. Note: The only reason why we’re doing ipconfig /flushdns here is because we’re testing from just one client. If we had four clients and pinged fileserver.lab.domain in turn, we’d get four different IP Addresses. - and using ‘ipconfig /flushdns’ and pinging fileserver.lab.domain to test, we get our 4 DR site IP Addresses which is exactly what we wanted. Our site has failed over successfully in DNS!